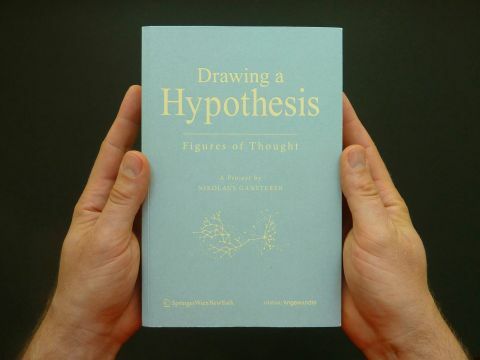 The publication project Drawing a Hypothesis arose from a five year process of exchange between Nikolaus Gansterer and theoreticians, scientists and artists. The results are quite remarkable, manifesting in cryptic and at times Rorschachesque diagrams, printed in juxtaposition with a corresponding written discourse, or hypothesis. The drawings and texts are connected by varying degrees of directness and imagination, and with surprisingly varied modes and genres of semantic engagement. The work melts truth and imagination together in the crucible, and meaning is actively forged through the process of the examination of the books contents, an examination that is as much of ones own subjectivity as it is of the subjectivity of the drawing and writing. There is a sense that the reading processes connect with the processes of creativity within and behind the text and images, that the reader plays a genuine role in the collaborative construction and interpretive authorship. This book is the publication of research stemming from these questions and gleaned through correspondence. The hypotheses in the book make their work at the edge of the perceptual landscape, gesturing towards (as yet) pathless ground and untrodden regions. There is a sense of discovery within the pages, of possibility, but also a sense of limitation and difficulty, essential in any meaningful inquiry, against which one must push if one is to progress. The approach is phenomenological in that it focuses around the object perceived and the mind that perceives, teasing out perceptual biases in an attempt to approach the event of apprehension in space and time. 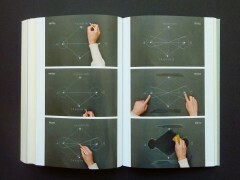 What is interesting here is the multiplicity of possibilities and functionalities of the diagrams in the book. Some are representative, acting as referential interfaces between the seer and the ‘real’. In others, the interface becomes abstracted from reference, graduating into an origin of consciousness in and of itself, a biased mirror for the mind of the interpreter. Some also are exploited for their interpretability, and used as convenient and surprising visual aids. The risks of these analyses, however, are that the categories are all too simple. The essence of the book occurs at a boiling point, where the tangible burden of conventional discourse reaches a critical temperature and becomes suddenly transformed, allowing the intangible to be configured and expressed. The imagination, the image of which is here present in diagrammatic form, both underlies and undermines hypotheses in a dual action with the potential of limitation and emancipation. There are a number of essays in the work that function as theoretical explanations of the perceptual process inherent in the apprehension of diagrammatic drawings (notably Susanne Leeb’s A Line with Variable Direction, which Traces No Contour, and Delimits No Form, and Emma Cocker’s Distancing the If and Then). These essays occur early in the book, contextualising the contents for the reader who chooses a linear approach to reading, starting at the beginning and finishing at the end. 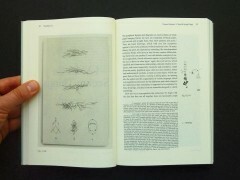 Each chapter, however, is discrete, and while the editing of the work provides a constant variation between genres of engagement with the diagrammatic (such as poetry, drama, archaeology, systems theory, history of drawing, neuroscience, etc), the book also lends itself towards selective viewing. A reader may attend intensively, passionately or laboriously with certain extracts whilst skimming over, and even ignoring, others. Sections of colour plates break up the hypotheses. Often depicting a process of creation, development and abstraction in sequence, these images frequently perform a correspondence with themselves, moving through stages of growth and decay. This is an enactment of the principles that the book is based upon, concerning how thought moves in a feedback loop in response to variations in the visual field and creative acts. The correspondence between stages mirrors the correspondence between Gansterer and all the other writers in the book. Gansterer describes the book as a ‘project’, a phrase that allows him to move away from finality and authorship, towards process and cause with deferred effect. An important book, Drawing a Hypothesis insightfully performs its speculations from the premise that we don’t know, and will never know, all there is to know about life and the universe, for these entities cannot be fixed, but are dynamic and relational phenomena.